Days of Our Lives (DOOL) spoilers tease that things are really shifting behind the scenes. The NBC soap has had plenty of comings and goings news lately. Some of the shockers have been great, like the confirmation that Jack’s (Matthew Ashford) back. 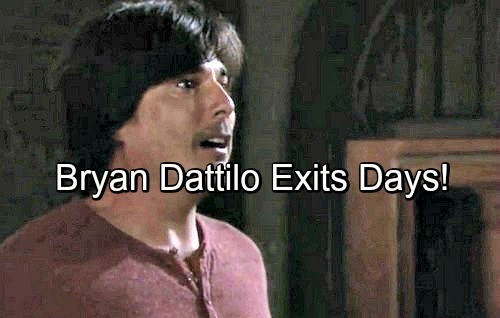 Other bombshells have involved tough departures and that’s always a bummer for DOOL fans. Of course, there’s a lot to unpack in that tweet. Let’s talk about why this is a big deal as well as why it’s a bit perplexing. For starters, we should note that Dattilo isn’t on contract. He’s just a recurring player, so why get rid of him as the tweet suggests? Wally Kurth (Justin) and Judi Evans (Adrienne) are in that same boat. They usually just pop up from time to time and everything works out fine. The “4 hours” part of this tweet points to Dattilo being fired unexpectedly. That’s a strange situation. It’s not like Days has to pay him big bucks or anything. Lucas is only featured on an as-needed basis, so maybe some drama went down. If not, perhaps the show just decided airtime would be better used elsewhere. They may not be willing to squeeze in his scenes anymore. Whatever the case, there’s a hint of shade in Dattilo’s tweet. He seems miffed that DOOL’s just tossing him aside after over 25 years. No one can blame him for that! Dattilo is certainly a fan favorite in the role of Lucas. It’ll be a shame to see the popular actor leave. Will Lucas leave town or just fade away? We’d hope the show wouldn’t kill him off for shock value, but anything’s possible. Regardless, this is definitely a difficult goodbye! Days of Our Lives spoilers say more comings and goings news is looming, so we’ll give you updates as other info emerges. Stick with DOOL and don’t forget to check CDL often for the latest Days of Our Lives spoilers, updates and news.